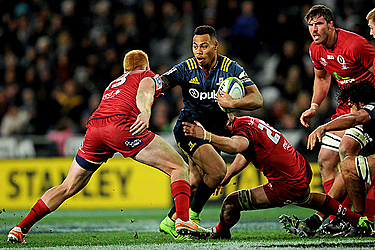 The Highlanders took their place among Super Rugby's quarterfinalists by beating the Queensland Reds 40-17 in the final round of the regular season on Friday. The Highlanders, the first New Zealand team to return to the tournament after a monthlong absence for the British and Irish Lions tour, scored six tries and qualify as seventh seed for the playoffs beginning next weekend. The players showed no signs of rustiness, rushing to 14-0 after only nine minutes, although they were guilty of occasional defensive lapses and should have taken more of their chances under the covered stadium in Dunedin. "We created a lot of opportunities but probably weren't ruthless enough in terms of finishing everything," Highlanders captain Luke Whitelock said. The Highlanders will play either the Crusaders or Johannesburg-based Lions in the quarterfinals, depending on the outcome of Saturday matches between the Crusaders and Hurricanes and the Lions and the Sharks. In late matches involving teams outside of the playoffs, Argentina's Jaguares overcame a 19-10 halftime deficit to beat the Melbourne Rebels 32-29 in Australia. And in a Super Rugby farewell for both, the Cheetahs beat the Southern Kings 21-20 in a game involving the two South African teams that will be dropped from the competition next season. The Jaguares, who won only four of 15 matches in their first year in the league last season, improved to 7-8 with their win in Melbourne. The Rebels finished last in a poor Australian conference, winning only one and drawing one. The Cheetahs scored second-half tries through Clinton Swart and Springboks wing Raymond Rhule to win in Port Elizabeth, South Africa, and take a little consolation from their season. The Cheetahs came back from 17-3 down after the Kings scored three tries. There is still uncertainty over the future of the Cheetahs and Kings, but they appear likely to join Europe's Pro 12 as Super Rugby is trimmed from 18 to 15 teams from 2018. One of the Australian teams will also be cut, with that choice between the Rebels and the Perth-based Western Force. The Australian Rugby Union hasn't announced which of those two will lose its Super Rugby status.